On 'Protective Edge' 4th anniversary, 1,460 Golani and Givati berets hung for return of Hadar Goldin and Oron Shaul opposite army HQ. 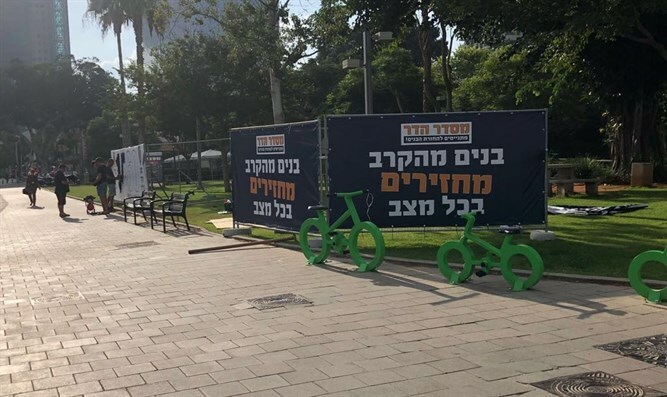 On the occasion of the four-year anniversary of Operation Protective Edge, the Misdar Hadar volunteer organization has begun this morning holding a special beret formation in the Sharona Garden opposite 'Hakirya' army headquarters in Tel Aviv. The exhibit marks the 1,460 days since the end of the war without the return of Lieutenant Hadar Goldin from the battle in Rafah and Staff Sergeant Oron Shaul from the battle in Saja'iya. In the evening, the project will include an event marking four years since the end of Protective Edge without the boys' return, with the participation of MK Amir Peretz, MK Oren Hazan, and the Goldin family. The beret exhibition will operate in the coming week and every day from 17:00 there will be creative activities in the adjacent garden for families wishing to identify with the struggle for the return of the boys.